The Emerald Lace Japanese Maple. If you are looking for a fast growing maple, with brilliant foliage, then ‘Emerald Lace’ is one of the best. The new foliage is a lime green with reddish leaf margins. The colour turns to a good green through summer and then to a good red t in autumn..
As this is a fast growing variety, a little formative pruning may be helpful. Good nurseries will already have done this for you on more advanced specimens. This is also a maple that will take a little more sun than most, however in warmer climates it is best in a position where it is protected form hot afternoon sun and hot drying winds. With a fast growth rate, and a pendulous habit this is a very attractive specimen tree. Best grown in a humus rich well drained soil with some moisture. A position that is protected from hot sun is best. Dig a hole twice the diameter of the container the plant comes in. Mix some well rotted compost and aged cow manure through the soil. Water the plant in the container a few hours before planting. Mulch around the plant to maintain cool root run. Water during hot dry periods over summer. A well formed tree will require little pruning after purchase. Only removal of any dead or damaged branches will be required. 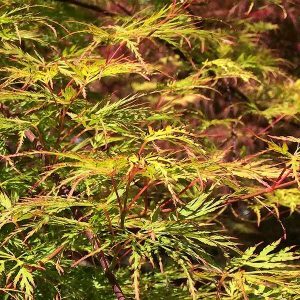 Common Name – Emerald Lace Japanese Maple. Foliage – Green lacy foliage turning to a good red. Spread – To 4 meters depending on conditions.